The name says it all! A versatile, revolutionary paper that won’t bleed through no matter what media you use, RendR lets you use every single page in your sketchbook. Create on both sides of the page — even solvent-based markers and acrylic washes won’t bleed through to the other side. 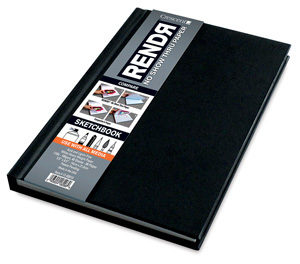 This sketchbook contains 48 sheets (96 pages) of RendR No Show Thru sketch paper. Hardbound Sketchbook, 8-1/2" x 5-1/2"